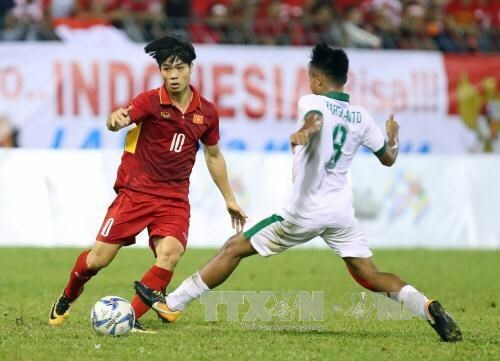 Hanoi (VNA) – Vietnamese U22 football player Nguyen Cong Phuong finished as joint top goal scorer of the men’s football tournament with four goals at the ongoing Southeast Asia (SEA) Games 29 in Kuala Lumpur, Malaysia. Phuong scored against U22 Timor Leste, U22 Cambodia, and U22 Philippines. The Vietnamese shared the title with Thanabalan Nadarajah of the hosts and Aung Thu of Myanmar, both of whom also netted four times.